← WHO DO YOU KNOW AND HOW DO YOU KNOW ‘EM? The idea that you sow what you reap has been around for a very long time, even before the time of Christ. The Hindu version is karma. 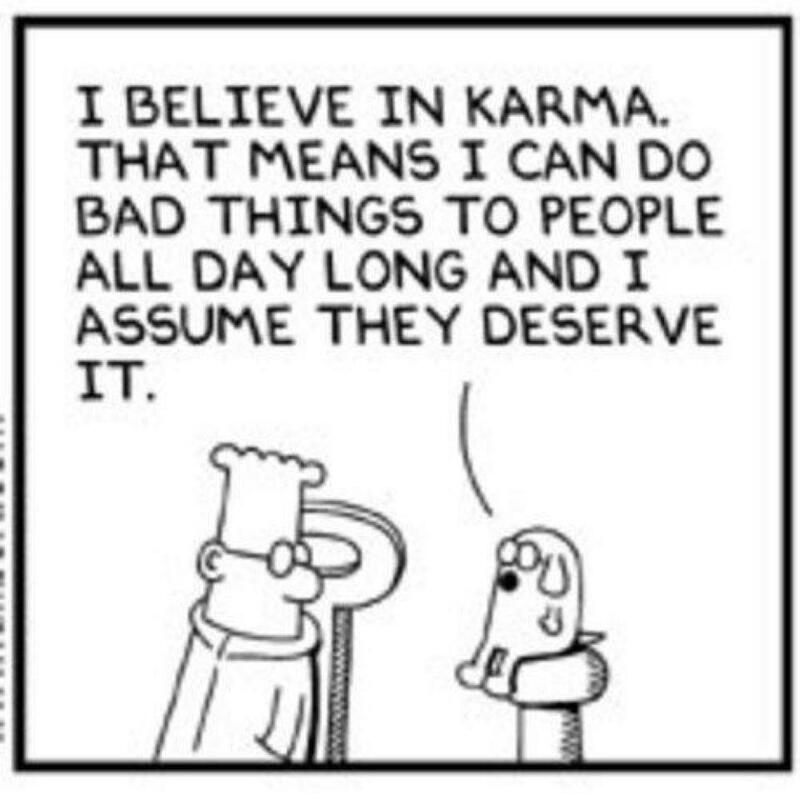 You sow good karma, you reap good karma in return. The Chinese have the philosophy of the “yin and yang” which is “bahlahns, Danielson” (think of “Karate Kid”) between good and evil. Star Wars conjoined these ideas into “The Force” with its good or “light” side and its dark side. Allow me a moment just to chase this important rabbit. Notice how Jesus responds to “Ye have heard.” His response is, “But I say unto you.” Throughout scripture any OT prophet or NT apostle who relays a message from God always qualifies his message by “Thus saith the Lord,” but not Jesus. He speaks by His own authority. He is the Lord. I just thought that’s a good thing for you to know. The Jews of Jesus day also had the idea that good health and material prosperity were a sign of God’s favor, i.e., good karma, as a reward for righteous living. Poor health and poverty were a sign of God’s disfavor, i.e., bad karma, as punishment for a sinful life. (See Deuteronomy 29:9; 1 Kings 2:3) Jesus debunked these perversions. For example, Jesus came across a man blind from birth and His disciples asked Him, “Master, who did sin, this man, or his parents, that he was born blind?” (John 9:2) They shared the prevailing thought that if one keeps the law, i.e., does not sin, they will prosper and enjoy good health, but a sinner will be punished with poverty or a debilitating disease. To put a stop to their stinking thinking, “Jesus answered, Neither hath this man sinned, nor his parents: but that the works of God should be made manifest in him … When he had thus spoken, he spat on the ground, and made clay of the spittle, and he anointed the eyes of the blind man with the clay, And said unto him, Go, wash in the pool of Siloam, (which is by interpretation, Sent.) He went his way therefore, and washed, and came seeing” (John 9:3, 6-7). The point is that there is not necessarily a direct correlation between your actions and the good or bad you receive in this world. There are many really bad people in this world – most of them in Washington D.C. – that enjoy great wealth and good health. On the other hand, there are many really good people who have low income and/or poor health. Yet the prevailing belief among many people remains that if one does good, one will receive good in return. This further translates into their view of eternity. They believe that in the end God will weigh their good deeds against their sin, and if their good outweighs their bad, they’ll make it into heaven. What they do not understand is that their deeds will indeed be weighed, but their deeds will be weighed against the Word of God (Revelation 20:12-13). Finding themselves painfully short of perfection, their names will be searched for in the Book of Life. Then when their names are not found there, their doom will be sealed for eternity (Revelation 20:15). Paul elaborates on the law of sowing and reaping: “For he that soweth to his flesh shall of the flesh reap corruption; but he that soweth to the Spirit shall of the Spirit reap life everlasting” (Galatians 6:8). The “flesh” here should be understood as our sinful nature. While we live in this fallen world, we retain that sinful nature. When we place our trust in Christ, our dead spirit is made alive. “And so it is written, The first man Adam was made a living soul; the last Adam was made a quickening spirit” (1 Corinthians 15:45). “The last Adam” refers to Christ who has been made a “vitalizing spirit” or a “spirit that brings life.” The meaning of the second birth is that Christ has made our dead spirit come to life. That spirit constantly battles the sinful nature that we carry in our flesh. Paul describes this struggle in Romans 7:14-23. In the end he cries out, “O wretched man that I am! who shall deliver me from the body of this death? I thank God through Jesus Christ our Lord. So then with the mind I myself serve the law of God; but with the flesh the law of sin” (Romans 7:24-25). As children of God, we have both a sinful nature and an eternal spirit. We understand from nature that what is fed will grow, and what is starved will wither or atrophy. We can feed our flesh by indulging our worldly desires like spending too much time on entertainment, watching or listing to worldly programming on television or the radio, listening to worldly music, reading worldly materials, etc. (I am not addressing non-believers, so my word choices should be clear to believers.) Alternately, we can feed our spirit by listening to Godly programming on television or radio, listening to sacred music that honors God, spending time in God’s Word, etc. If we feed our flesh, our desire for worldly pleasures will increase while our spirit will grow weak. Paul warns that we will reap the consequences for “sowing to the flesh.” God does believe in spanking His children. On the contrary, if we feed the spirit, God will enrich our lives (not necessarily in material ways) so that those blessings will reach into eternity. You reap what you sow.